If the GIXXER Cup class of motorcycle racing was a film it would be a Hollywood blockbuster; if it was a book, you wouldn’t be able to put it down. 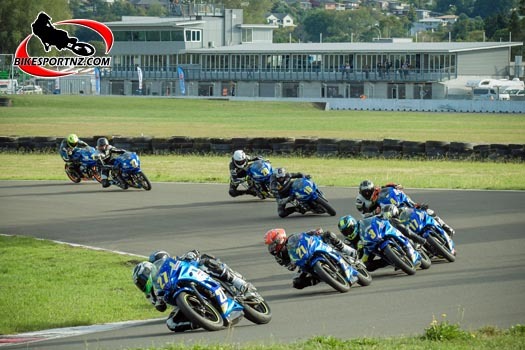 As it was, spectators were not able to look away as the GIXXER Cup races again threatened to steal the spotlight, this time at the fourth round of five in the 2019 New Zealand Superbike Championships at Circuit Chris Amon, Manfeild, at the weekend. The two-day event had it all, with GIXXER Cup action so close that riders were clipping one another’s handlebars and scratching the bikes’ paintwork in almost every corner and even down the straights. 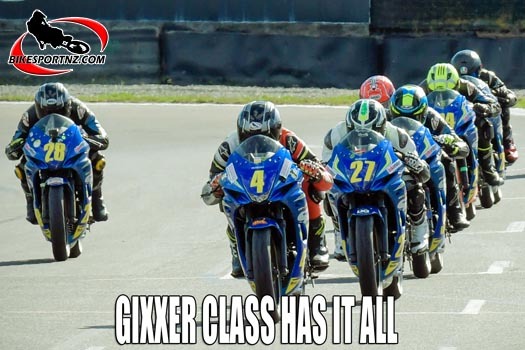 The GIXXER Cup class was introduced to the New Zealand motorcycling scene first the first time in December 2017, with all riders competing on identical Suzuki GSX150F bikes. Reserved for riders aged between 14 and 21, the GIXXER Cup – with the tagline “Growing Future Champions” – is a production racing class that provides a springboard towards a successful racing future at higher levels. Because it is a level playing field in this “motorcycling nursery ground”, the cut and thrust racing has been about as feverish and frenetic as it can get, although it is Hamilton’s Jesse Stroud, Taupiri’s Zak Fuller and Greymouth’s Clark Fountain who currently lead the way. While these three riders are on top of the standings after Manfeild, it could so easily be any of a dozen or so other riders in that position, with a gaggle of 10 or 12 riders crossing the finish line almost as one on each of the three occasions they raced at the weekend. Stroud has now seen his lead margin shrink from 38 to 27 points after Fuller won the weekend at Manfeild, but the Hamilton rider remains in the perfect position to wrap up the trophy at the final round at Taupo’s Bruce McLaren Motorsport Park this coming weekend. The 17-year-old Fuller was thrilled though to be able to gain ground on his main rival. “I clawed a few points back and puts me within strike range of Jesse Stroud. I go pretty well at Taupo and looking forward to racing there. “It was so hard here at Manfeild because it was hectic. I dropped back from first to eighth at one stage, but managed to fight my way back again. The racing was so tight at Manfeild that Whanganui’s Caleb Gilmore finished the weekend first equal, only losing out to Fuller on the count-back rule (with Fuller having placed better that Gilmore in the last race), while riders in third and fourth overall, Stroud and Fountain, also ended the weekend with identical points. The two GIXXER CUP riders ranked fifth and sixth at Manfeild, Whanganui’s Cameron Goldfinch and Sanson’s Shane Miller, also finished the event on identical points and only able to be separated by the count-back rule. There were three different race winners at the weekend – Fuller, Gilmore and Stroud. “It has been a remarkable competition right from the beginning,” said Suzuki’s Simon Meade, the General Manager of Motorcycle/ATV/Marine Marketing. While the racing was certainly heated and intense at Manfeild, it was also interesting to see the close camaraderie that existed within the GIXXER Cup “family” of riders. When Whanganui’s Luca Durning crashed out of the weekend’s second GIXXER Cup race, his bike shattered and almost unrecognisable afterwards, the GIXXER Cup riders and their parents rallied around to offer a replacement for the young rider and he managed to finish eighth in the last race of the weekend using the borrowed bike. Meanwhile, in the premier 1000cc Superbikes class, Glen Eden’s Daniel Mettam was unstoppable, three wins from three starts boosting him to the top of the championship rankings. He now heads previous Superbikes class leader and fellow Suzuki star Scott Moir by five points, with another Suzuki rider, Wellington’s defending national champion Sloan Frost, in third place overall as the series heads now to the deciding fifth and final round at Taupo’s Bruce McLaren Motorsport Park next weekend (April 6-7). Other class leaders after round four of the series are Rangiora’s Avalon Biddle (Supersport 600); Palmerston North’s Jacob Stroud (Supersport 300 class); Papamoa’s Leon Jacobs (250 Production class); Jacob Stroud (Superlites); Whangamata’s Ben Rosendaal (650 Pro Twins, provisional); Australia’s Yanni Shaw (125 GP) and Christchurch’s Dennis Charlett and Will Clim (sidecars).